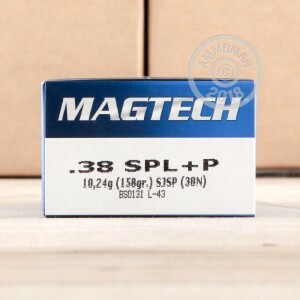 Load up your handgun and protect yourself with this 38 Special +P Magtech ammunition! This 50 round box will be delivered to you in brand new condition for a very economical price. 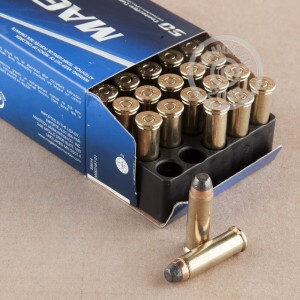 This self defense ammo features a 158 grain semi-jacketed soft-point bullet. The SJSP design is excellent for self defense as it penetrates deeper than just a regular hollow point bullet. Because the tip is soft, it expands to the fullest capacity once it hits the right depth, causing massive damage. SJSP bullets have been known to deform and tumble once inside the the intended target, making even a badly placed shot deadly. These cartridges have nickel plated brass casings with Boxer-primers and are reloadable. You will have no feeding issues with this product and the clean burning propellants are easy on your barrel. Magtech's history dates back to 1825, giving them many years to perfect their products. Their components are of high quality, making their ammo meet or exceed expectations. You will be very satisfied with your 50 rounds and come back for more!